Remember Preity Zinta and Bobby Deol meet allegedly due to a Superman wax statue falling at Madame Tussad’s at London? Well,in the picturisation of the song Kiss of Love, there’s a hidden tribute to the Superman movies. As Zinta and Deol sing, if you look carefully, you’ll see the crystal architecture of the Fortress of Solitude ! The script will be written by spiritual author and Virgin Comics co-founder Deepak Chopra. during colonial times and becomes a spiritual warrior. 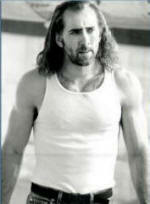 I would like to see someone much younger than Cage to play James’ role. Mark Wahlberg or Hayden Christensen would be much more suitable ! I missed out issue 2, so issue 3 was a shocker for me. When we left them in Issue 1, Rama and Lakshman were fighting the asura army at Janasthan. Turns out that it was not led by Ravan but Viv-shan, a 3392 version of Vibhishan. Lakshman gets wounded in battle and the Asuras outnumber the Armagarh forces. Rama surrenders in return for Viv-shan’s word of sparing the women and children of Janasthan. Both Rama and Viv-shan apparently break their codes of war. Rama for surrendering and Viv-shan to not live up to the Asura code of “no mercy”. Rama’s surrender is viewed as treason by the Armagarhian council and he is exiled for fourteen years. Embittered, more human than the maryada purushottam of the epic, this Rama is even criticized by his brother Lakshman. This exile is somehow more believable as Rama searches for a new life and meaning of his life. Issue 3 starts in the desert as a wandering Lakshman gets saved from a bunch of assasins by an old sage who calls himself Vishwamitra. When they get introduced, the sage is interested in getting to know where is Lakshman’s blue-skinned brother. Tired and hungry, and fascinated by the sage’s powers Lakshman agrees to go along with him as they search for Rama. Eventually they find him, with a fishing community, living as a commoner. Lakshman informs Rama that their father is no more, he passed away after Rama’s exile. The Council of Armagarh started to get corrupted and Lakshman had assasination attempts on his life. Finally he left to try and locate Bharat and Shatrughan, and assassins followed him, until he ran into the old sage. Vishwamitra then tells Rama that he is blue skinned as he came from a different ‘loka’ and that his origin and the powers of the Asuras are related. He then asks Rama, Lakshman to follow him to discover Mithila, the fabled land, which has a secret power that the Asuras are after. If that falls in the hands of Ravan, the destruction of the world will be nigh. In issue 4 they discover the kingdom to Mithila, where they save a lady who was being apprehended by a group of Asuras. Vishwamitra reveals that this lady is the answer to the world’s problems and that Rama will be her protector. The graphics of the Ramayan have improved tremendously from Issue 1. The bleakness of the protagonists’ luck is mirrored by the dark colors used. Rama’s blue skin goes well with the bitter and moody persona he’s given in the story. He and Lakshman even come to blows. Graphics are quite portrait-like, and one area that could use some improvement by way of help is the action sequences. The story has turned gripping and it needs to be seen as to what will Sita’s specific role. What is the power of Mithila which is desired by the Asuras? Yes, I am hooked now. I guess it’s the time to remember Green Lantern’s creator. Martin Nodell, mainstay artist of the American comic book’s first great flush period and either the sole creator or co-creator of the Green Lantern character, depending on if you emphasize design and concept or first comic book story, died on Saturday morning in West Palm Beach. The Green Lantern character is an interesting one for superheroes because it combined a magical background, via a mystic ring that exuded an energy that obeyed the commands of its wearer, with a superpower that expressed itself through active and passive elements, a perfect match for the comic book form in which anything could be drawn by an artist with an active imagination. 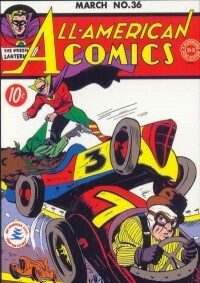 In a way, the Green Lantern character could be said to be the most comic bookish superhero of them all, enjoying a status on that level with characters like Batman and Superman as the best-realized of the single-device superheroes, but never enjoying the crossover success into other media, probably because of the uniquely creative nature of the character’s power when put into use. Both the original Green Lantern and the science fiction-style 1950s makeover of the character continue to play an important role in DC’s ongoing storylines. Sadhu is good, but just wait and watch for Ramayan Reborn (Now Ramayan 3392 AD). It will simply blow the minds off, India has never seen Ramayan like this I can assure that much…since I am the writer. [:)] you wanted a retelling of the Amar Chitra Katha…now read the retelling of the oldest and greatest epic in the world. Jai Shree Rama. In a lot of ways it does not fulfil the promise. The story has been retold with a fairly futuristic approach and yet a lot of old elements have been retained. The future in the story is not a very optimistic future. There has been an apocalyptic war and the ecology was destroyed. Earth is surrounded by a radioactive haze and humans only live at Armagarh in the Aryavarta continent where they have managed to penetrate the haze and get some sunlight. In the other parts of Aryavarta live ‘anthropomorphic’ beings like Vanaras, Garudas and others. To the south lies the continent of Nark, hellish in all senses as the name implies. Ruled by Ravana who is a creature spawned by the apocalypse and who seeks to establish his rule over the Aryavarta kingdom too. The kingdom of Armagarh (not Ayodhya) which is ruled by Chief Councilor Dasarath who has four sons – Rama and Lakshmana from the deceased queen Kaushalya and Bharat and Shatrughan by Kaikeyi – the story tries to give a reason for Lakshman’s bonding with his blue-skinned elder brother, the reason being tied to blood relations. He is more hot-headed, outspoken and resentful of his step-mother and for his father’s lack of time. Kaikeyi unlike the Kaikeyi of the traditional epic is no sullen queen in the kop-bhavan sulking. She is empowered as she is a councilor in the kingdom’s governing council. She is also quite a racist, believing the humans should not join forces with other beings. Kshatriyas for warriors and use of Aryavarta for the ‘civilized’ continent might actually reinforce caste and cultural stereotypes. No sooner have they reached that they realise that the outpost is under attack by an army of Asuras led by Ravan himself. The graphics are a quite disappointing. For whatever reasons, close-ups of the protagonists do not convey the intensity of the story as much as the graphics of the landscapes do. With the exception of Lakshman, whose distinctive red markings on the face help in conveying his anger with his parents much more eloquently than his expressions. The final full page graphic shows Ravan who looks more like a beast than his traditional ten-headed humanoid form. 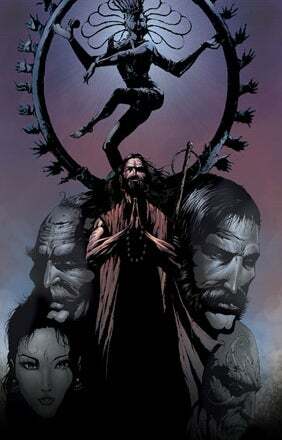 The question that it leaves one with is – would Ravan be shown as unidimensionally as the artwork suggests – in future issues? One hopes not. Ravan’s character is the epic is wonderfully diverse and rich. Ramayan 3392 AD’s success would lie in making both Rama’s and Ravan’s character multidimensional and not caricatures like Ramanand Sagar’s teleserial. Curiosity makes one looks forward to the rest of the story. Where would Sita come in? And everybody’s favorite monkey god, Hanuman? Does this Rama have divine nature and will it be revealed? And how will the stories be radically different from Ashok Banker’s series of Ramayana?